Children are naturally curious and are willing to explore their surroundings. They may unintentionally ingest objects or substances within reach, found most commonly in the household. The ingested foreign bodies are typically small objects such as coins, fish bones, marbles, and drugs. In particular, the accidental ingestion of magnetic foreign bodies in paediatric patients has become common due to the increasing use of toys with magnetic elements. These magnetic toys (henceforth referred to as multiple magnets) possess significant injury risk when more than one is swallowed. It is our job as healthcare providers to prevent and manage these ingestions. This article reviews the risks, management, and complications of multiple magnet ingestions in children. The rare-earth metal magnets composed of neodymium, iron, and boron are 5 to 10 times stronger than the typical refrigerator magnets made of ferrite and have been increasingly used in toys and marketed as adult desk toys with different names like neomagnet, neodymium magnet, buckyballs, etc. These sets typically consist of 20 to 216 small, powerful, spherical magnets that can be linked together to create a wide variety of shapes and patterns. Despite being marketed to adults and may bear clear warning labels on the package, these novelty toys often fall into the hands of children. If ingested, a single magnet is typically passed unnoticed; however, if multiple magnets are swallowed together or with another metallic object, sequelae are significant and can be life-threatening. These magnets pose a unique hazard owing to their ability to forcefully attract one another across loops of bowel, leading to pressure necrosis of the intervening bowel wall, hollow viscus perforation, intestinal fistula, sepsis and potentially death. In the first quarter of 2018, three children were admitted to the American Hospital Dubai due to ingestion of multiple magnets. 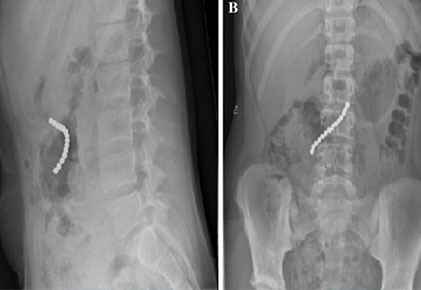 In two of these cases, the ingestion was witnessed by the parents while the third one presented features of acute intestinal obstruction and a radiologic examination showed the presence of multiple magnets as a causative agent for the intestinal obstruction (Figure 1). 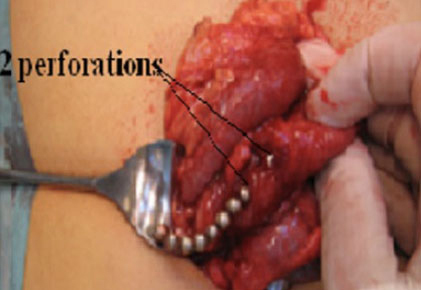 Emergency operations were needed for 2 of them to remove the magnets and manage the multiple bowel perforations and fistula formations (Figure 2). One of the children was observed strictly with radiologic examination monitoring till the magnets passed out spontaneously. At our Hospital, once the multiple magnetic materials are identified, the practice has been to remove them by endoscopy while they are still in the stomach to avoid serious sequelae. If the magnets pass through the stomach, then we try strict conservative management with serial imaging daily for a few days. If this fails, as lack of migration of the foreign bodies, serial images show a gap between magnets, or the patient deteriorates clinically, then emergency surgery (explorative laparoscopy or laparotomy) is promptly indicated. Sometimes the strict follow-up is successful, and the magnets found attached to each other all the way according to abdominal radiographs have came out with defecation after 2-4 days. Similar guidelines were published by the author in 2012. My previous experience with magnet ingestion was reported in 2012 and a campaign was undertaken to remove such magnetic toys from the market. Large institutions and centres published many reports from different countries and as a consequence, various consumer safety and government organisations across the globe began using regulatory powers to restrict or curtail the availability of these products. Most developed nations have regulatory authorities tasked with ensuring consumer safety and protection. For example; in the US, this responsibility is granted to the Consumer Product Safety Commission (CPSC), and in Canada, Health Canada serves that role. These agencies must identify new hazards, quantify relative levels of harm, and use their legislated powers to promote public safety. The consumer protection agencies have various options at their disposal to enforce policy. Among these, a product recall is the strongest, and as such is typically reserved for cases where other approaches are deemed insufficient. In 2014, the CPSC issued a strong federal safety standard for high-powered magnets. Under the Consumer Product Safety Act, this performance standard stipulates that any magnet manufactured or imported on or after April 1, 2015, must be large enough to decrease its ingestion hazard or the magnetic force must be lowered. In Canada, a mandatory product recall was established in 2013 and resulted in a significant reduction in the morbidity associated with ingestion of multiple magnets which was demonstrated clearly in a recent study that was published in 2017. In the UAE, there has been a significant rise in the incidence of multiple magnet ingestion among children that was noticed in the last couple of years (from our experience and from the direct contact with other paediatric surgeons in the UAE). This is mainly due to the availability of these magnetic toys in the market and online shops. We think that healthcare givers should continue to counsel patients on magnet safety, discuss safe and age-appropriate toys, and warn about the serious health hazards associated with magnet ingestion. Adolescents should be discouraged from use of magnets which may lead to unintentional ingestion. In the event of ingestion, parents and patients must seek immediate medical attention, as delay in management may increase the risk of complications. We need to clearly highlight these potential risks and ask the appropriate regulatory authorities to take an action to remove these magnetic toys from the market in order to safeguard our children from threat of multiple magnet ingestions. Despite their attraction, high-powered magnets are an avoidable source of potentially life-threatening injury. Parents and caregivers should remove them from the reach of children, and medical providers should maintain a high index of suspicion of their ingestion. Consumer protection agencies need to enforce certain policies to reduce the alarming rise in multiple magnet ingestion among children in the UAE.